Logins this hour: 6632 ? The "who's on" list. At Amion, on-duty staff light up as active and turn grey when the shift is over. If you want switchboard staff to page the correct person, shift times must be accurate. Personal calendars. The Amion app and personal calendars should show the correct start and end times if you want staff to show up on time! Tally reports. For accurate tallies or reports via the Amion API, Amion needs accurate shift times. Amion calculates hours in 15-minute increments and uses custom clocks to provide exceptions on any day. Click on the service/shift name on the left side of your schedule. In the Infobox window, use the arrows (or simply type) to change the start and end times. The defaults are 8:00am and 6:00pm. To have shift times appear next to shift names on the schedule, go to File / Preferences / Shift scheduling. Select Show shift times next to shift names. 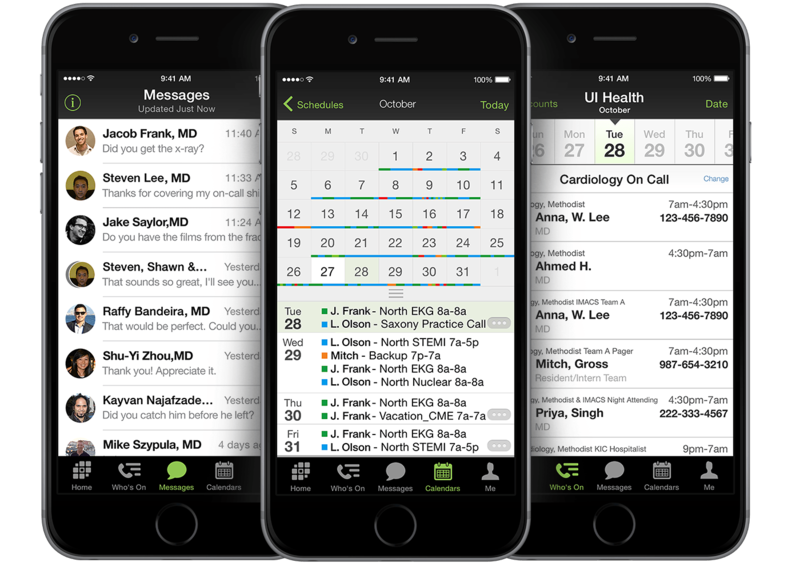 To set Call schedule times, click on the service name on the left side of your schedule. In the Infobox window, click on the white clock icon at the bottom right corner. Set the begin and go home times. 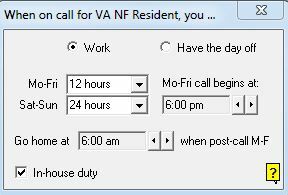 Designate the duration of the call for weekdays and weekends. For instance, if your Call service is 7a-7p, 12 hours Mon-Fri, but 7a-7a 24 hours on weekends. To set Shift schedule times, click on the shift name on to left side of your schedule. In the Infobox window, use the arrows (or simply type) to change the start and end times. Set custom shift times for attending and resident schedules. For example, shift A is from 7am to 5pm for weekdays. But on weekends and holidays, it is 24 hours from 7am to 7am. Right-click on the assignment cell where you need to add a custom time and select Shift times. In the pop-up window, set the custom begin and end times. A clock icon appears in the assignment cell. Hover your cursor over the clock to view the custom times. In the custom shift time window, use the colored icons above to make the custom times the default hours from that date forward, repeat, entering in meal breaks, remove the custom time, and turning off displaying the clock icons on schedule. Note: As of July 21, 2017, custom holiday hours may repeat. When adding a custom time on a highlighted holiday, the down blue repeat arrow in the box appears orange. 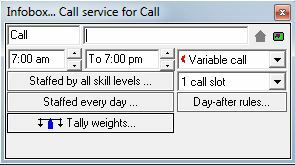 If you do not see this feature, update OnCall. Here we discuss shifts. This page describes times.